First Communion: Is my child ready to receive? 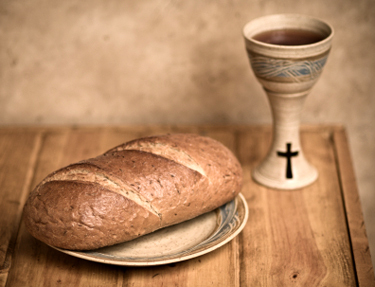 First Communion Class begins March 9, 2014, at 10:15 a.m.
First Communion will be celebrated on Thursday, April 17, at our 7 p.m. Maundy Thursday Service. Only the first question requires a “Yes” before your child can be considered ready to receive his or her first communion. Use the others to generate discussion and to plan, in consultation with Pastor David Tinker, for your child’s preparation to begin receiving the sacrament and the gifts it brings. Over a generation ago (1969) many Lutheran congregations began separating First Communion from Confirmation. Thus, they began preparing children to receive their first communion when they reached fifth grade. Both the former American Lutheran Church (ALC) and the former Lutheran Church in America (LCA), predecessor church bodies of our Evangelical Lutheran Church in America (ELCA), affirmed this practice. In its 1989 publication “A Statement on Communion Practices” the ELCA affirmed the fifth grade and/or ten years of age as an appropriate and desirable guideline for when a young person, after appropriate preparation, may first commune. This is not the end of the story, so please read on. However, it became apparent that focusing on a particular age as the primary criterion for determining when first communion is received did not adequately consider other important factors, e.g., a child’s maturity, a child’s experience in the church, a child’s family as a supportive context for faith, discipleship and understanding, etc. After years of study and conversation, in 1997 the ELCA issued a new First Communion guideline as part of a larger document on the centrality of Holy Baptism and Holy Communion in the life of faith. Notes from “The Use of the Means of Grace: A Statement on the Practice of Word and Sacrament”, Augsburg Fortress, 1997, pages 41-43. My congregation still practices the age method of deciding when First Communion happens. It’s a discussion I would like to have in the future, as I agree whole-heartedly with the ELCA’s guidelines. Your questions are very thoughtful and speaks to the heart of preparing children for their first experience of coming to the Table of the Lord. I teach sacramental preparation in the Catholic Church and I use similar questions when working with the parents. I’ve done several posts on this theme as well. Many blessings on you, the children and parents. Our first Communion is the first Saturday of May.